VISUAL STATS OFTEN TEACH me more than lines of text and this quick screen (at left) from Google Analytics reminded me of a few things I'd forgotten. I'd forgotten the power of a newsfeed. 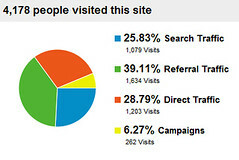 Google Analytics treats the 262 January visitors from Feedburner as part of a campaign, yet there's no campaign promoting the Inside View newsfeed. That's because the feed comes in too many flavours and I'm trying to ensure Feedburner is smart enough to deliver the correct content to the appropriate device. At the moment, I need a better feed result when content goes to Kindle. With Say Media's help, I'm also cranking out feeds for all the categories on my blog. That's very straightforward on Wordpress but a little more work with the advanced templates I'm using on my own blogs. When I get it right, I'll have sections of my blog feeding out as a Kindle document subscription, available for the twelve people reading my blog via their Kindle, Kobo and Nook. I think there's an untapped campaign in that cohort because I believe people are searching the web for "subscribe via Kindle" and taking the bait when they find it. That's a worthwhile campaign in my book. Michele Neylon -- "Captain Obvious Says Blogging Regularly Gets Traffic, using Fat.ie as his reference point, blogging at Michele.me, January 29, 2012. "Subscribe via Kindle" had "about 133,000 results" when this blog post published. "Subscribe by Kindle" had fewer than 10,000 results on a Google verbatim search. TWITTER IS TAKING STEPS to selectively censor messages country-by-country when it receives "a valid and properly scoped request from an authorized entity." I wonder what that means to free range tweeting but I imagine how some commentary from ground zero of protests will be muted. 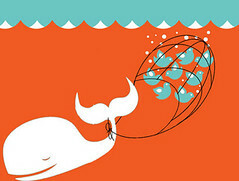 Twitter already deletes content (tweets, images and links) when presented with DMCA requests. " I'm listening to what Christian Payne makes of the Twitter policy in the audio clip below. I'd expect Twitter would seriously consider requests to scrub certain hashtags from its timelines in the county of origin. Marshall Kirkpatrick wonders, "If told to do so by a government massacring its citizens in the streets, will Twitter render all people in that country unable to see messages of protest on its network? Will shouting into such an eerie silence change the way such Tweeting campaigns also engage with the outside world?" This kind of thing is bound to happen before the end of 2012. I think it's the cost of doing business. I DEDICATED MY SUNDAY NEWSROUND to making a shout-out to Sean Sherlock, the Dail deputy empowered to hammer home the Irish version of SOPA that will damage the innovation culture of Ireland. I'm unsure whether the Deputy is listening to the chorus of advice emanating from the Irish tech sector. I've made a YouTube clip about the problem, using the excellent points raised by Adrian Weckler in his Sunday Business Post columns. Without being hyperbolic, I believe Ireland is at the same point in transitional history as the world was when the Church was trying to constrain Gutenberg from printing copies of the Bible for the common man. Closer to the present, I know how easy it will be for a big business to get a court order that constrains a small company from displaying information on its website. With a well-argued copyright allegation, the music business could obtain a court order shut down a URL if the judge felt the alleged offender hadn't paid the market rate for a music sample in promotional material on a website. This happens now whenever This Week in Tech plays certain video segments about contentious issues on YouTube. If the TWiT newsclip merely repeats a portion of a video clip while a panel of experts discusses it, a rights holder can simply petition YouTube to pull the clip. With the Irish version of the law, a judge could be persuaded to shut down the entire website, not just an infringing video clip. This is wrong on so many levels. And yet, that's the kind of judicial power that Sean Sherlock and friends want to cede to the judiciary. Don't Irish politicians see the immense harm they will inflict upon innovative creatives in the start-up community if they pass this law? Watch this on YouTube by clicking on the image or listen to it on Audioboo. Subscribe to Inside View of Current Affairs. ONE OF THE FIRST things friends do when I hand them my Nokia Lumia 800 is flick through the phone's apps to see how many familiar icons they see. They often mutter something when handing back the phone. Nokia have a lot of work to do during the next year if former Nokia users can be prised from their iPhones. Those iPhones were a quantum leap from Symbian for most owners because they did things faster and used an interface that people enjoyed. 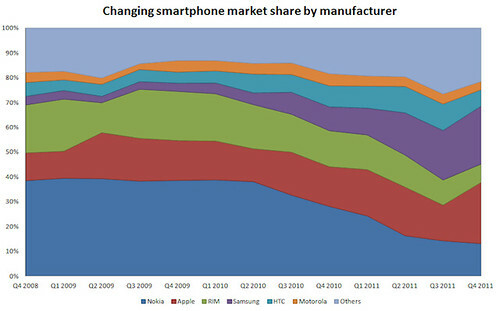 Nokia had 46% market share of mobile phones in Ireland when the iPhone launched in 2007. A lot has changed in five years, including the way people used their phones. When people started buying iPhones because their friends had iPhones, they often started connecting through apps, not voice or text. 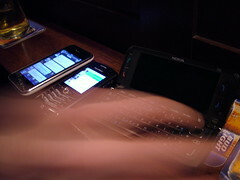 Now those apps represent the mobile environment through which people define their worlds. 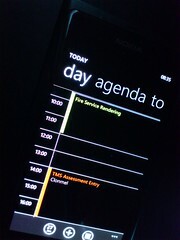 And as a late starter in the touchscreen game, Nokia has an apps deficiency. I HAVE A HUAWEI E585 WIFI DONGLE on its last legs but when it's working, it occasionally delivers faster upload service than a higher spec Vodafone broadband USB modem. I can normally get the Voda USB modem to run two or three times faster than my O2 dongle, especially in the Dublin metropolitan area. Today, along the banks of the River Liffey in County Kildare, the O2 dongle is kicking its Voda brother in the speedtest stakes. I can't imagine life as a mobile warrior without a mobile tethering service. I use both the dongle and the USB modem to successfully run Online Meeting Rooms video sessions and Google Hangouts. Last week, I used the O2 dongle as a wifi hotspot service for third level students in LIT-Clonmel when a piece of network hardware failed. The Huawei E585 permits the connectivity of five devices simultaneously and that was fine for several project teams working on campus. PLENTY OF VIRAL VIDEOS will emerge in 2012 but Walk Off The Earth's work is the first one I've spotted in 2012. At its current rate of viewing, I reckon the first of March will show that more people will have watched the cover of "Somebody That I Used To Know" than the original. If you need multiple Google Calendars as well as Exchange Calendaring and perhaps a personal booking system using Windows Live, you’ll be happy to know you can easily sync multiple Google calendars like I do in the colour-coded screenshot. To add them, just go to m.google.com/sync on your phone. Log into the web page, select your device and toggle the calendars you want to sync. You can sync up to 25 Google calendars onto your Windows Phone. Before leaving the screen, tap and save your settings. I've also bookmarked the page in my Lumia browser. These newly synced calendars appear whenever your phone syncs with Google’s servers. If you've commanded your phone to save battery power, it's not going to sync your calendars. 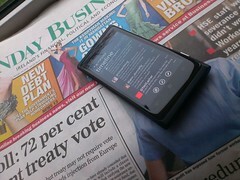 By default, my Nokia Lumia looks at Google for sync data every half hour. When I set an important appointment on my calendar, I normally sync it before I leave the meeting that set the appointment. The Windows Sync team at Google also have enabled the Lumia with an ability to search for Gmail messages that haven’t been downloaded to the phone yet. That's also handy. The option to "search more in Google Mail" is found at the bottom of the results list for a local search. More detailed instructions from Microsoft. Li Yin -- Sync multiple calendars using advice from the Windows Sync team at Google. I GET A LOT OF VALUE from unconstrained mobile storage of personal media and Sony's new Walkman Z1000 looks like it will allow me to carry all the HD video clips that we produce in the creative multimedia curriculum at LIT-Clonmel. The weakest link in the latest generation of mobile phones is a lack of removable storage. That's what I face with both iOS and Nokia Lumia. Consequently, I cannot sync the collections of HQ audio and video I receive every week from dozens of students as they prepare scratch work for final assessment. I have to step gingerly through collections as they arrive, then manually direct specific clips onto my mobile devices. This is a time sink because of the limited storage space on my personal media players. Sony's Z1000 comes with a 64 GB offering along with 512 MB of RAM, certainly big enough for my personal DVD and academic work for the next two years. The only problem is a cost point around EUR 380. But there's a lot for that money. 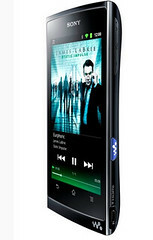 The Walkman Z1000 has a nVIDIA Tegra 2 dual core processor, runs Android 2.3 with full Android Market access, and it has an anti-reflective 4.3-inch capacitive touch-screen LCD display. I don't need cellular connectivity on my personal media player. I do need HDMI output and that's the way the Z1000 is set up to communicate with our big screens. I HAVE BOUGHT more Nokia handsets than any other manufacturer's and Nokia remains the world’s largest seller of mobile phones by volume. It's declining in terms of market leadership and revenues. AFTER MONTHS OF HARD USE, the iPad has brought us neck pain and shoulder discomfort. But there's hope for the afflicted from the Harvard School of Public Health. Harvard researchers could have viewed iPads in my Flickr photostream where my family is caught in full flow with the iPad, holding it in laps, in hands, on tables, and propped up to watch videos. Across all of these modes of use, Harvard researchers concluded that people run a "higher risk of neck and shoulder discomfort compared to normal laptop users" because of the poor posture when head and neck angles are strained. Nothing in the iPad sales literature points out that your head and neck require more forward flexion when using a tablet device. If you've a tablet and you want to avoid the strain, you should consider specific placement for your iPad.